The first 20 minutes were literally the Product Stream. The Cardfight Club, heading to the cardshop, are brought before Kyou. Aichi and co. facedown Kyou, who was turned into a Zombie by Rekka, who tries to turn them into PSYQualia Zombies. And the girls dance together for the first time. Melody – [CONT](VC/RC):During your turn, this unit gets [Power]+5000. This is shared by all of your units with Melody. 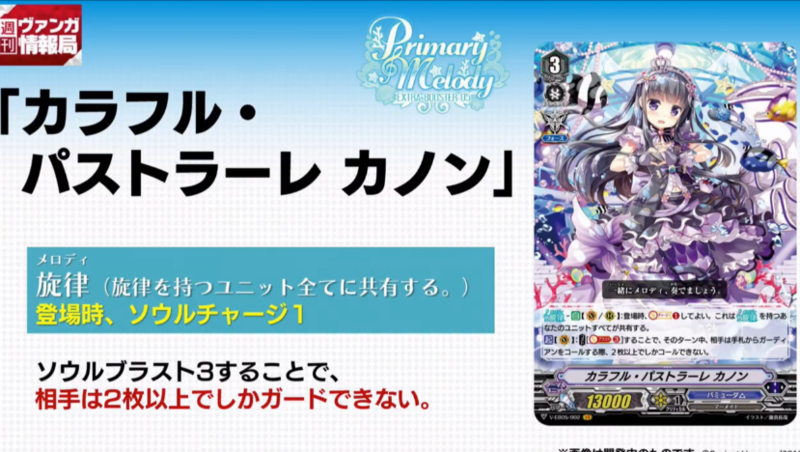 [ACT](VC)[1/Turn]:COST [Counter Blast (1) & Soul Blast (1)], reveal cards from the top of your deck until a card with Melody is revealed, call that card with Melody to (RC), and shuffle your deck. Melody – [AUTO](VC/RC):When placed, you may Soul Charge (1). This is shared by all of your units with Melody. [ACT](VC):COST [Soul Blast (3)], and until end of turn, when your opponent would call guardians from his or her hand, he or she can only call two or more. Q1. Do Units with the same name have their “Melody” abilities synchronize? A. Yes, it does. For example, if you have 2 “Colorful Pastrale, Sonata” in play, they both gain 5000 Power, resulting in a total buff of 10000 Power each. Q2. When a Unit with “Melody” is retired, do the other Units they synchronized with lose those abilities? A. Yes, they lose them.